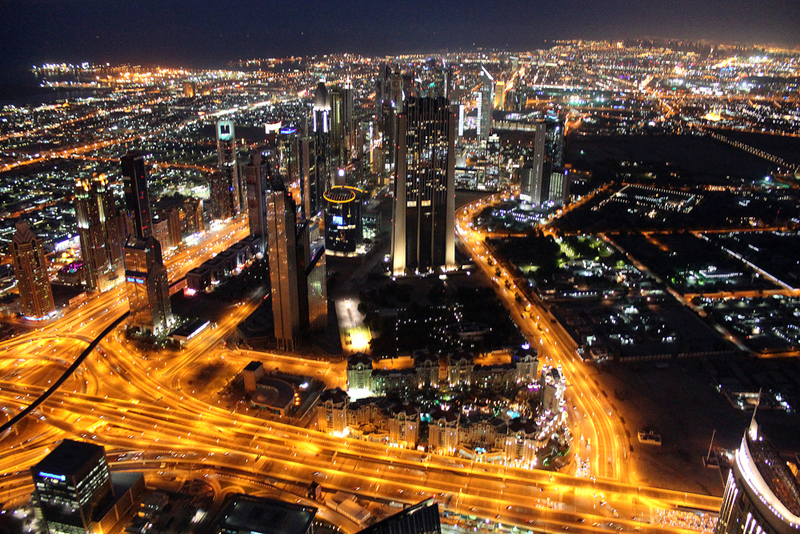 I love Dubai! For me it’s a great city, very safe and clean, very structured and efficient. Even as a western woman one doesn’t need to worry when walking around alone even at nighttime. It’s probably one of the safest places I travelled, maybe even safer than my small hometown in Germany. 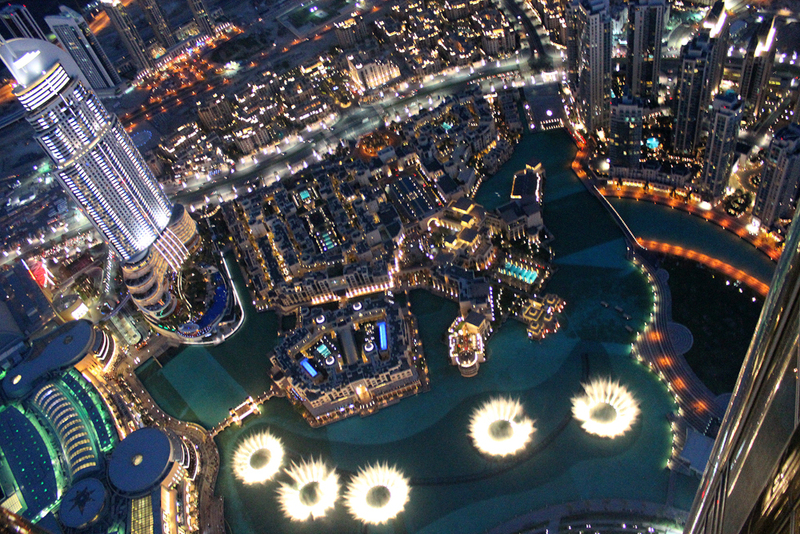 Considering that at the beginning of the last century Dubai has just been a small settlement at the Persian Gulf and that it’s nowadays a supermodern Metropolis with 2,1 million residents, I am quite impressed. 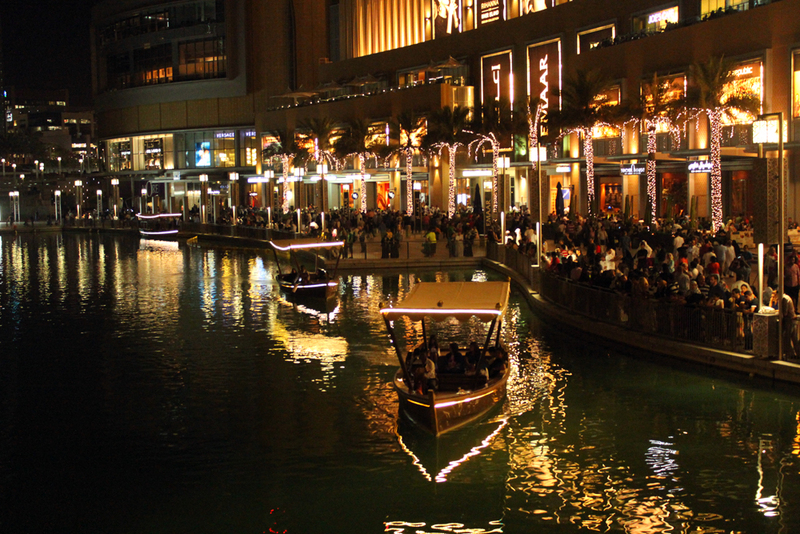 I have been lucky that last time I could spend three days in Dubai so I was able to see many of the amazing sights of the city. So it’s not that bad that this time I have only the one day in Dubai. After breakfast I check out of my hotel room. I had originally planned to visit the Spice Souk in Old Dubai which was closed for a couple of days due to a very important public holiday during my last visit. But as I have an entry ticket for the Observation Deck of the Burj Khalifa for 17.00 hours I don’t want to be late there as one has to punctual to get up. So I take a walk to the Mall of the Emirates which is only about 500 metres away from my hotel. 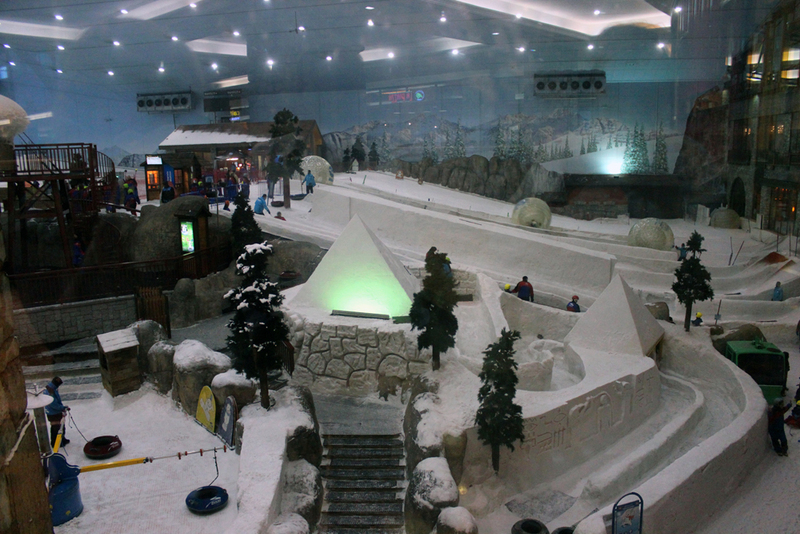 That is the Mall which hosts “Ski Dubai”, a big indoor ski slope. After spending a couple of hours strolling through the Mall, I return to my hotel from where I take a taxi to the entrance of the Observation Deck of Burj Khalifa which is inside the Dubai Mall. My taxi driver is from Karachi, a seaport in Southern Pakistan and the biggest city of the country. He complains about the current heat in Dubai which surprises me as it is 1. currently not that hot as it is just early April and 2. I thought, that in Karachi it is at least as hot as in Dubai or even hotter. I have been up on the Observation Desk of the Burj Khalifa during my last visit already, but had an entry ticket for 10 AM where the lightning conditions are suboptimal to take photographs. I had purchased my ticket online two days in advance and they were pretty much sold out for most of the day. This time I bought my ticket more than three weeks in advance, so I had the chance to get a ticket for the late afternoon. This time the queues at the entrance to the Observation Desk seem to be longer than last time, it takes about 45 minutes till I am up. While waiting people are informed about the height and the construction time of the building through an information board. The construction work of the Burj Khalifa started in January 2004, the final height of 828 metres was accomplished in January 2009. 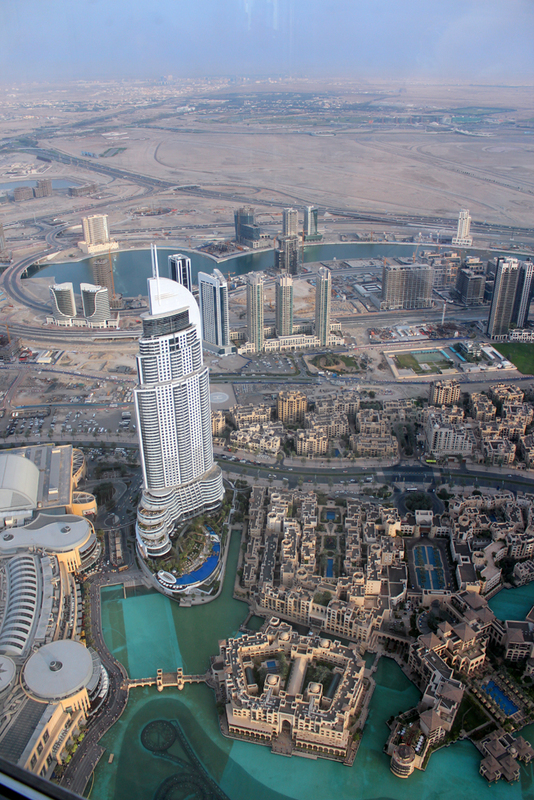 Till its inauguration on the 4th January 2010 it was called Burj Dubai, since then it is named after the President of the United Arab Emirates, Chalifa bin Zayid Al Nahyan, one of the investors of the tower. It has 189 floors, 163 of them useable. Since 2008 it’s the tallest building in the world. For the construction of the upper floors a few thousand tons of steel of the demolished Palace of the Republic which was situated in Berlin were used as Recycling Steel. 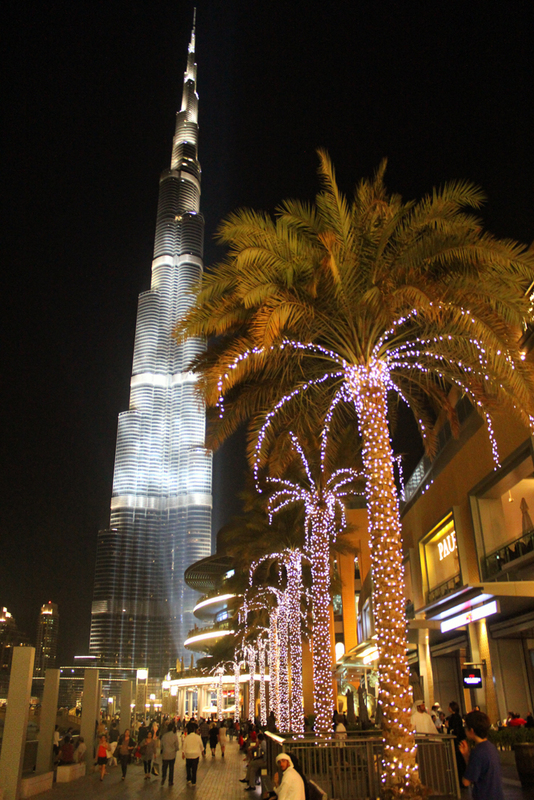 The Burj Khalifa marks the centre of Downtown Dubai, a new city development area. I reach the Observation Desk, which is also called “At the Top”, short before sunset. So this time I am lucky to have the best lightning conditions for my photographs. 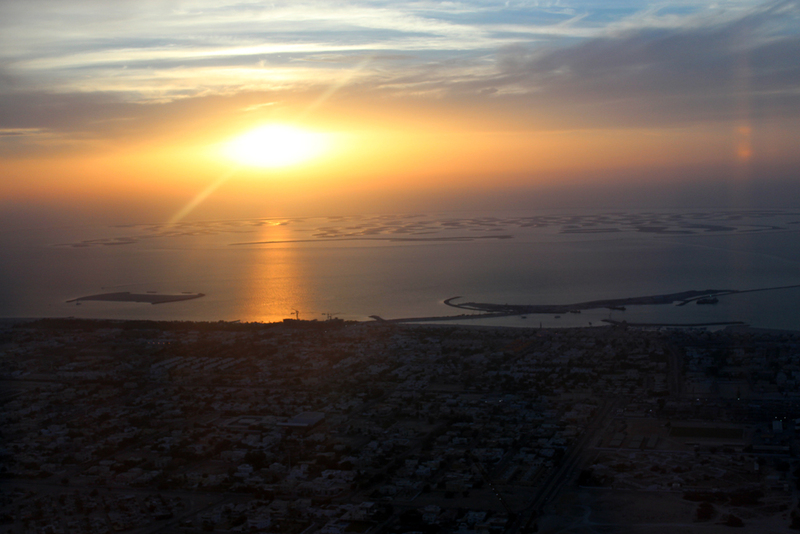 I am spending about two hours “At the Top” and so I am able to take photos before and while the sun sets plus night photographs of Dubai from above. Back down I am strolling through the Dubai Mall which opened on the 4th November 2008 and is one of the biggest shopping malls in the world with 1.200 shops, the biggest Gold Souk worldwide, an Ice Rink and a huge Aquarium over three floors. 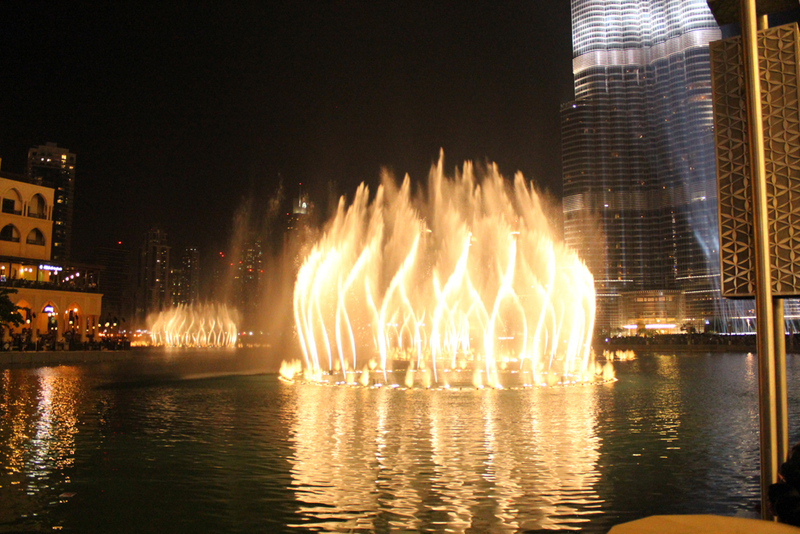 I find myself a place at the outside terrace of a restaurant right opposite of the Dubai Fountain, the biggest music triggered water feature in the world. 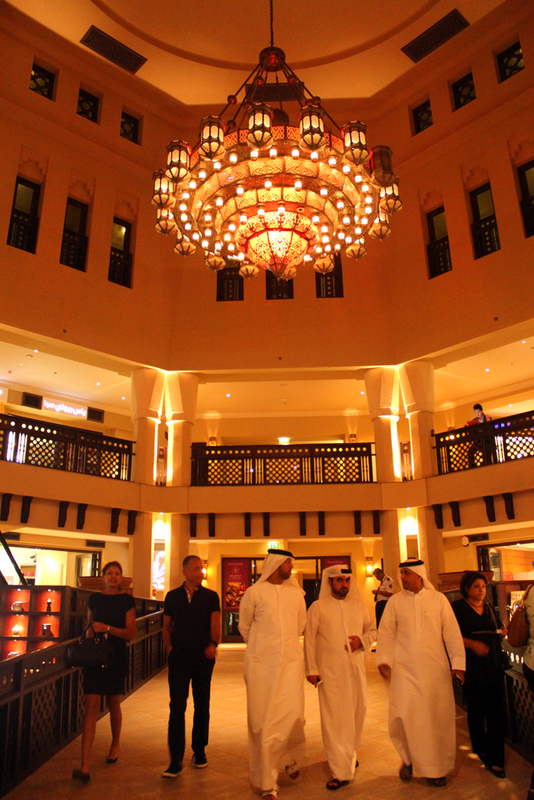 After dinner I am wandering a bit through the Gold Souk and then take the metro back to my hotel where I have stored my luggage. There I get into conversation with Pa Pa, the same receptionist who welcomed me yesterday night. She is from Yangon, the former capital of Burma, and flies home on the 15th April to see her family. When I tell her that I haven’t been to Burma yet but that it is high on my bucket list and that my parents have been to Burma three times already and love the country, she smiles. At around 12.30 AM I take a taxi to the airport. When waiting at the Gate for my flight to Beijing I am feeling a little nervous. I have travelled several countries on four continents but I was mostly able to communicate in one of the languages I learned. People who have been there told me, that English is not widely spoken in Beijing. 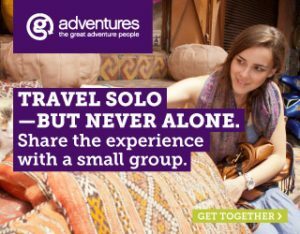 As I have three days there on my own before meeting my group and my tour leader on the 14th April, this will be quite an adventure. A few Gates next to mine passengers are waiting for their flight to Bangkok. I have been there many times, so it seems to be very tempting to just change Gates, but I resist the temptation. The plane is again not booked out and I am again lucky to have a full row to myself. As the aircraft is an A380, the rows are wider than normal. After Take Off I lay down and as I am not very tall, I can almost stretch myself completely. I fall asleep immediately and only wake up when they serve some sort of dinner respectively nightmeal at 4.30 AM but fortunately manage to sleep again afterwards.